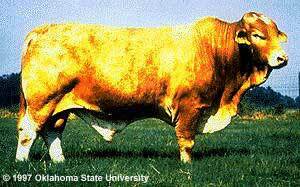 Beefmaster cattle have been developed by the Lasater Ranch then headquartered in Texas. The breeding program leading to their establishment was started by Ed C. Lasater in 1908, when he purchased Brahman bulls to use on his commercial herd of Hereford and Shorthorn cattle. The first of these bulls that he used were principally of Gir breeding, although some of the Nelore breed were also used. In 1925 he introduced Guzerat blood into the herd. 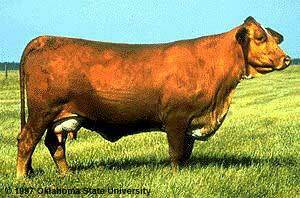 Mr. Lasater also developed a registered Hereford herd in which the cattle had red circles around each eye. In both his Brahman and Hereford breeding, milk production was stressed. Following his death in 1930, the breeding operations came under the direction of his son, Tom Lasater, who began to combine the breeding of the Brahman and Hereford cattle and also used some registered Shorthorn bulls. After making crosses of Brahman-Hereford and Brahman-Shorthorn, he felt a superior animal had been produced and called the cattle "Beefmaster." The exact pedigree of the foundation cattle was not known. 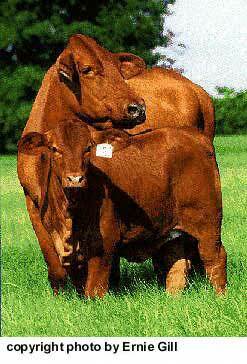 The breeding operations were carried on in multiple-sire herds nd rigid culling was practiced. The Lasater Ranch estimates that modern Beefmaster have slightly less than one-half Brahman blood and slightly more than one-fourth of Hereford and Shorthorn breeding. The cattle were handled under range conditions that were often adverse, and a culling program was started based on disposition, fertility, weight, conformation, hardiness and milk production. Stress was placed on the production of beef. No selection has been made to characteristics that do not affect the carcass, such as horns, hide or color. The Lasater Ranch breeding program provided an interesting example of the use of mass selection in reaching a goal. Critics should recall that other breeds have been established in a similar way - a blending of breeding followed by selection for economically important points Uniformity in many breeds has been achieved only after many generations of selection. The original concepts of Tom Lasater in developing Beefmaster cattle have continued. Selection continues for those points which were originally used by Mr. Lasater and are now known as the Six Essentials - Weight, Conformation, Milking Ability, Fertility, Hardiness and Disposition. Considerable progress has been made in selecting cattle that give very satisfactory levels of production under the practical and often severe range conditions. Satisfaction by ranchers and creditable performance in feedlots indicate the value of stressing the important utilitarian points in developing breeding herds.